Hi, I’m Manou. I used to live in Bombay. I’ve been travelling since October 2013. Features: Museum at FIT, New York. Tasveer Journal. New Yorker. The Hindu. The Guardian. Zeit Magazine. The Economic Times. H&M. ELLE India. BuzzFeed. Commissioned work: V&A Museum. Tommy Hilfiger. Yahoo Style. Wallpaper*. Burberry. Bungalow 8. HT Brunch. Madura Garments. Cosmopolitan. GQ India. ELLE India. The Hindu. Vogue India. worn by a few of them via your pics. Fantastic Manou!! Great compilation,loved the way you have put it. Hey interesting blog! IAM BIG on street fashion! You can visit my blog on http://www.girlyhour.com ! Cheers.. 🙂 and i’ll find my way in one of your pics! I am in Mumbai now.. yet still unsure which city I belong to.. like your photographs.. came via Facebook.. Thank you creatist. I like all your photos in your portfolio..and couldn’t find your wordpress blog. Go! Go! says the woman behind the eyepiece. I have been following various street style blogs from around the world, all the while wondering why there wasn’t one from India. 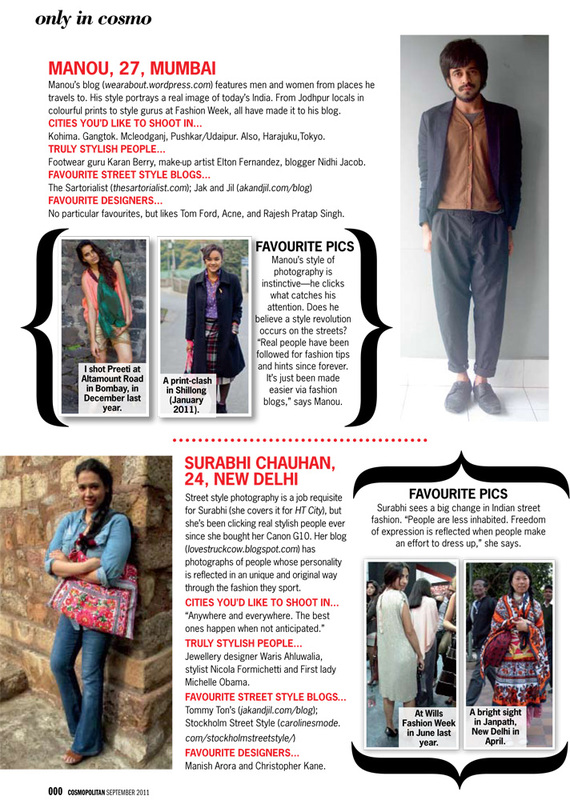 I mean, we have stylish people too who deserve to be blogged about! So, I can’t tell you how glad I was when a friend told me about your blog. I was all the more delighted when I visited your blog because you are actually doing an awesome job. The street style pics you have are in every sense of the term, inspirational! and i have just launched my label, i have sent a fb link, please check it out. and if u like anything and would like to use it for your shoots or something i would be more than happy. whenever u have the time. keep the energy flowing through your work. Its great. Lovely work, well written as well. am glad we have street blogs like yours in india. Recently came across this blog after reading about it in Indian Express. Really enjoyed reading it, especially the recent post on shoes. I started a blog myself and it’s good to know there’s so much diverse writing on fashion. Its a priceless experience going through your chic and mind-blowing blog. 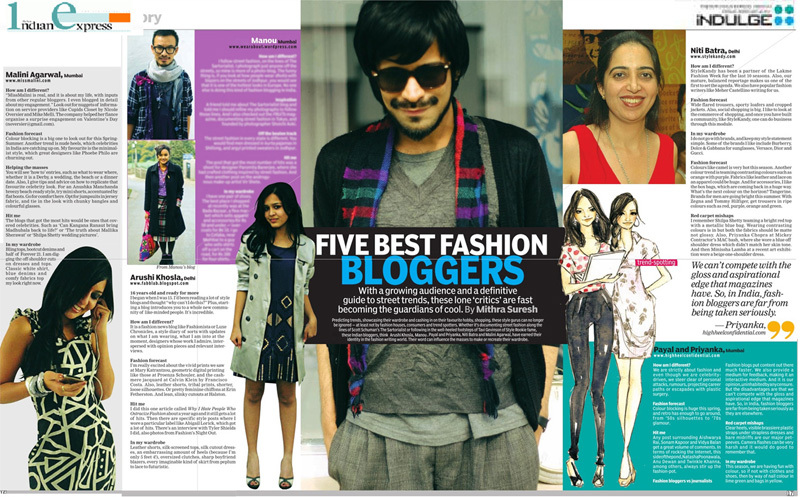 I have been on the lookout for good Indian fashion blogs which are serious fashion and less pretense. Im glad I found this. Well, you’re as awesome as awesome one can ever be! I just came upon your blog. It’s very nice, lovely pictures! HEy! saw the betty entry on your blog! loved it, thanks! also love the pictures from bunglow 8, fresh and cool..
Hey! Sorry..I didn’t reply for long. I just didn’t know what to say and how to react..I was looking to say something more profound than just a mere thanks…but I guess I don’t have anything profound to say…so well..thank you all for the comments and appreciation. I’ve always wanted to start a streetstyle blog… but I never got around to doing it. It’s a great thing that someone else has! You do have an eye for fashion which is something – ironically – most fashion bloggers severely lack! had seen you at lakme this time…dint knw ur d force behind tis blog…anyways ..gr8 wrk..
u forgot zooey glass and bernard arnault. fabulous work. Hey, I love your shawl pictures in the Shillong section. Thanks for putting them up. Loving your work, read about you in an issue of elle, I’m a groupie… Do you have a team working for you? I’d really like to be a part of your process, im an aspiring stylist and designer, and I’d really like to work for you, learn from you… I’m a quick learner! Hey Aayushi. Thank you for writing. No I don’t have a team. I work on my own from home and there isn’t really much of a process. It’s just photographing and putting photos up. And I think it’s the same for most bloggers. If you’re an aspiring stylist/designer, I suggest you start a blog of your own. Hi, I thought I was the most fashion forward Indian in Australia. But I’ve certainly got nothing on the people on your blog. Such fine, unafraid dressers. Thank you. Very interesting. I’m going to stop by for more doses of Manou. 🙂 I especially like the people profiles you’ve done. I took your advice, i started writing a blog yesterday, its gonna take some time to get used to it though, im not exactly what you call tech savvy. Eitherway, thank you so much, and one more thing i’d like to say. You’re somewhat of a genius, i’ve been following your work since you got published in elle, and i must say, i’d really like to work with you someday, not for you, for me… And please, do take a look at my blog, if you get the chance. Its called Couture Diaries. you have a very unique style and the quality of ur images are refreshing inspite of it being shot in india, very pro. if i may ask. wat camera do you use? I would like to know more about your discoveries/inspiration as well. i think i need to follow u on twitter for that. I love your blog not just because its about India but also because it appears that your photos communicate not just that you like the image the person makes against the backdrop but also because somewhere it communicates what life might be like for the subject. Your work is amazing & so different than other blogs. I wish you posted much more regularly. Please be regular? I wish you would take an apprentice, i am so mesmerized by your work !!! Hello! Is there an email i could get in touch with you on? Street fashion has finally come of age in India. I was wondering if you would like to collaborate with us for a guest post on our blog? Fantastically Awesomeee blog it is!!!!!!!! 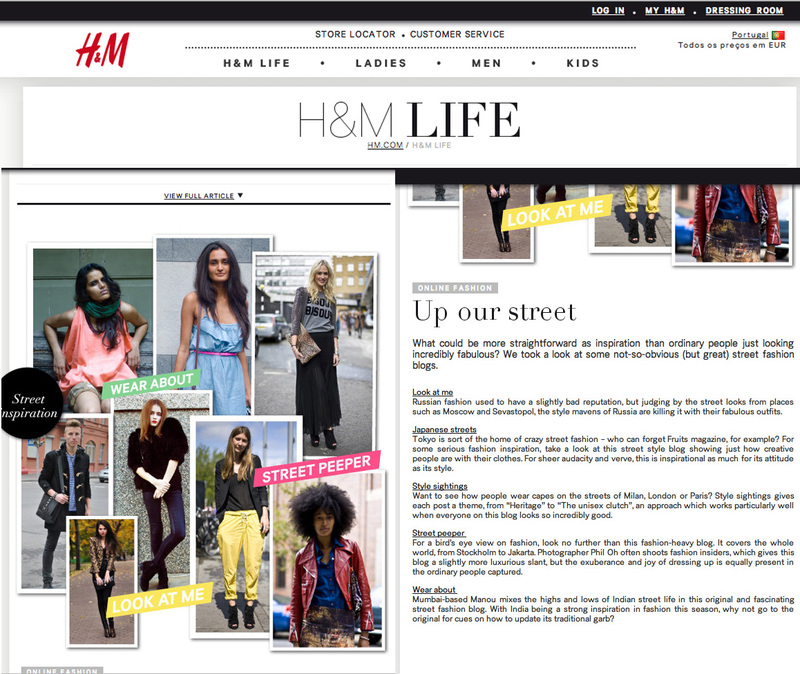 !keep up the good work…..street Fashion has always Alwayz inspired me….and the mini interviews are the cherry on the cake!!!!!!! I love your blog! Style me and I’ll do your dishes! I like doing dishes myself. But maybe you could cook some food for me? I loved your blog, its so beautiful…It just reminds me of those colorful roads of India, where I grew….simply awesome! OMG you’re a guy?!? LOL, no offense, going through your fabulous blog posts I somehow pictured you as a woman. Guilty as charged (on stereotyping fashion blogs with the female population)! LOVE your blog! Love your work…..
I’ve been avidly following persons like the man repeller and the sartorialist,to name a few. Pleasantly kicked to come across an Indian fashion blogger with a personal statement, cleanly designed site(!) and focus on individual style rather than purely retail brand/celebrity value Your site makes me happy for all mentioned reasons. What lovely photographs. The way you capture people and their presences is truly amazing. Not really interested in fashion, but I keep coming back to your blog for the visual documentation that you provide. Best wishes. I love wat u do!! U can do even better! cool man i love the pics from shillong,,, people , india ,, streets ,, areas, culture ,, dress,, etc bla bla bla ..
People in the Indian streets have always inspired me …. Till we meet, let’s be in touch. Hello I love this blog. I come from Germany and I LOVE FASHION! I like the colourful and the black, the casual and the glamorous. I like the conservatice and the unusual fashion. I love them all and i live them all. This blog is fantastic. I am so happy I found your blog! 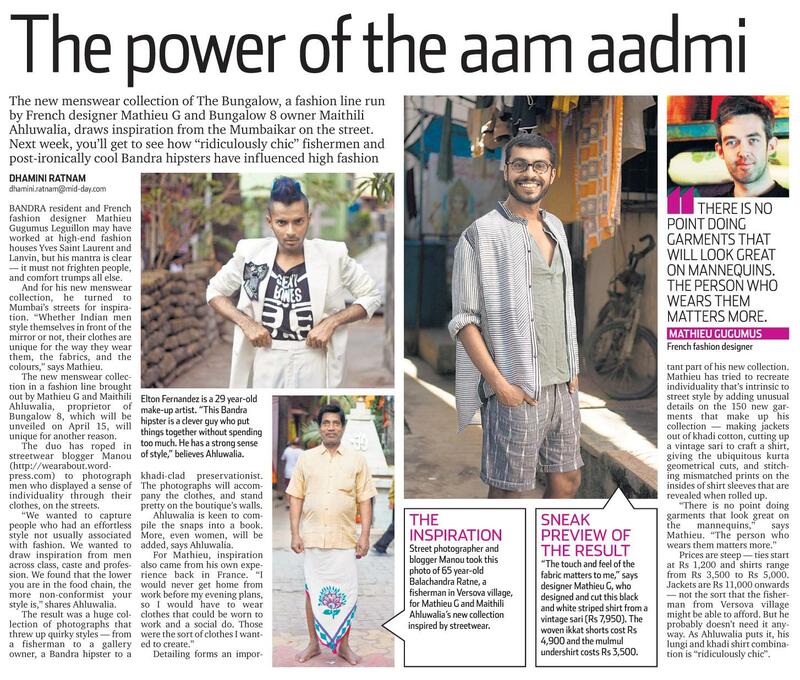 I was just in Bangalore last month and upon my return to the states I was kicking myself for not taking more pictures of the brilliant, unique street style I got to see there. It was such a lovely palette of traditional, modern and in-between. I hope Indian style maintains that vivacious quality that elevates it beyond the blue/grey/black/beige monotony that you see a lot of here. Keep up the good work! Must say, excellent stuff you’ve got going here! I work as a strategist at an ad agency called BBH (www.bartleboglehegarty.com) in Mumbai. We’d like to invite you to our office for a tete-a-latte and show us your work, talk about yourself, why you do what you do and what you do with what you do. We’d also like you to give us some insights on rural Indian fashion, urban Indian youth fashion, what role you think fashion plays in forming the Indian youth identity today et al. Would you be interested? If yes, can I call or email you to discuss this and take it further? I just stumbled upon your blog and wanted to say that I have truly loved surfing around your posts. And I hope you post more very soon! hey manou….it’s archit here!!! hope you remember…so how have you been???? and i must say i loved what i saw on your blog….amazing pics!!!! and less pretentious!! !i didnt really have much idea about people documenting street fashion but now when i see wearabout its truly great to see…especially when it’s from you!! !keep going bro….. Thank you Archit. Of course I remember you. Email me and tell me what you are up to. My name’s Samantha, I work for American Apparel, the fashion and basics company. I came across your site this morning and I wanted to email to see if you might be open to discussing advertising. We work with a lot of the biggest fashion sites, like Karla’s Closet, Zanita, Chic Muse, Fashion Toast and many more. The way our deals work is that we pay $10 each time someone views or clicks an ad on your site and then makes a purchase of any size from one of our online web stores. You can run the ads as much or as little as you want, and you can cancel at any time. I can’t disclose figures, but we do pay well–some sites make a couple hundred dollars a month, others make a couple thousand. The higher the traffic, the better they convert. We change the ads all the time to make sure its interesting and fresh. Anyways, we’d love to work together. If you’re interested, just let me know. I’d just need to fill out an insertion order with you and we can start serving same day. If you have any more questions please don’t hesitate to ask. sucha a nice compilation..ENVY.. ;):) never goto think of people and fashion the way you do..!!! And i would love to show some samples.. This is surely the most interesting fashion blog, I’ve seen in a long time. Not sure which city do you call your home. I would love to connect with you regarding an event which I want to invite you for in Mumbai. Do mail me your contact details to take this conversation forward. I am from Shillong and have gone through your blog.Its really awesome to see such beautiful shots in our city where different ethnic group are living.Shillong is the home place of the Khasis.But one will really amazed with the different ethnic group residing here.And I can say its a cosmocity of the East India. Hi, I’ve nominated you for the One Lovely Blog Award; please visit my website for more details. Stumbled upon this one while looking for stores in Bandra. Pleasantly surprised. You\’re like the Indian Sartorialist. I think I picked more than just the lovely pictures. Keep blogging. Hello Hema. I’m not too keen on having any advertisers on my blog at the moment; want to keep it ad free. Thank you for writing. Hey, I started a fashion marketplace for gently used bridal and partywears – http://www.festsy.com We also have a blog where I would love you to guest post. hoping to see more of your works from NAgaland! When would you be available in Mumbai? Need to discuss some assignment with you. Hi, We would like to showcase your images under a special editorial. Pls let me know in caes you are interested. Hey Manou. I met you at Aurus two weeks ago. Sorry, I acted like such a dork(and about injuring your foot haha). I love your blog. Just went through your blog, it’s quite interesting. It reminds me of the street fashion images from this fashion magazine called Nylon. I’d like to feature you in one of the Taj Group of Hotels publication. Please tell me how I can get in touch with you. Hey Pallavi. You can contact me on my email listed above in the description. could you please send me an active email address of yours. would like to inform you about brand happenings. Hello. The email address listed above in description is active. However, I’d prefer not to receive any information about brand happenings. They are of no use to me. I recently came across your blog and found it fresh and a pleasure to read! I work with BarCode91.com and am usually very stingy about giving out complements 😉 Good Job! Congratulations to you on your wonderful blog. Just another westerner who visited India, fell in love and longs to go back and explore more. Your blog is the next best thing until I can make that happen. The style I saw in India was so unique, mixing traditional with modern and in vivid ways that were so eye-catching. 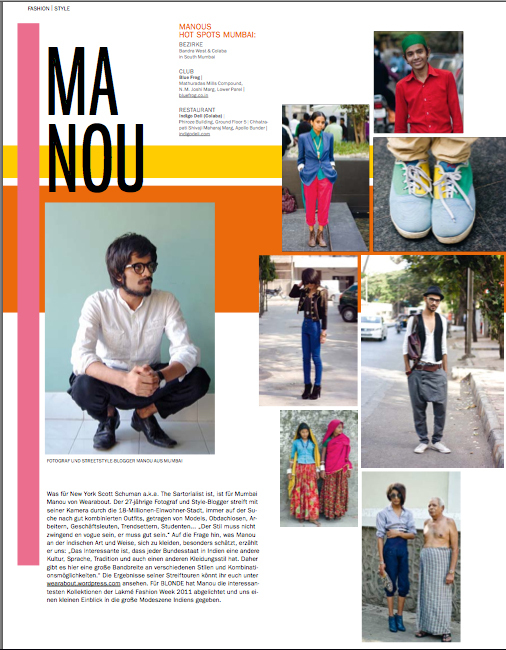 Keep up the good work, Manou, and stay stylish, India. What is policy of using ur images ?? Hey! If you use them online somewhere just give a link back to my blog. That’s all. This Blog has now become my favorite blog! I am new in the blogging scene and I was told by a lot of people about your blog and now I know why! love each and every picture! Manou, i’ve got so many more dreams written to share! Your work is excellent. I’ve included you in a list of recommended friends here: http://theastro.tumblr.com/comrades let me know if you’d prefer otherwise. Umm..I’ve been writing my dreams too every now and then. You should start publishing yours. Hello Manou. More than glad that I stopped by and had a 15 minutes of visual delight of beautiful street photography. 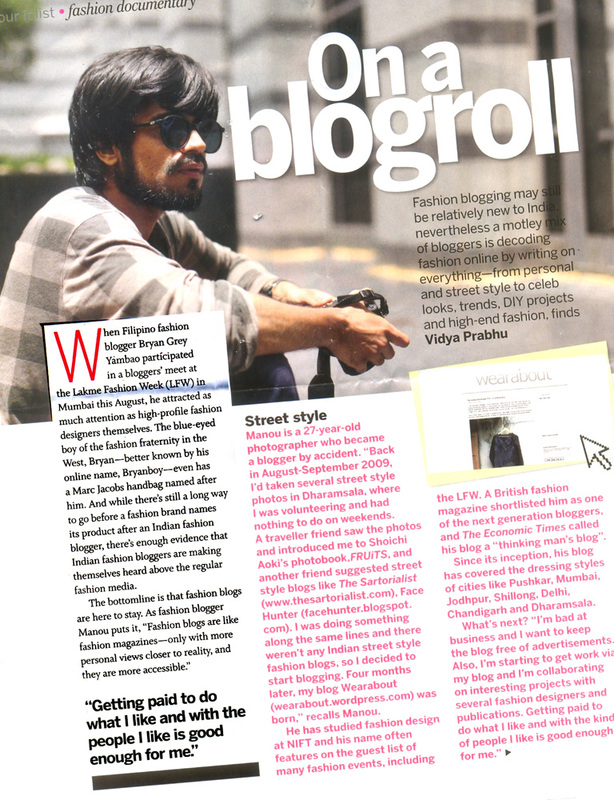 I happened to model once for Bhane and through reading came across your blog:) One more fan/follower in your long list. If you have spare 2 mins, do drop by to check my penning. would love to get your feedback. Cheers. i too have a blog and though its not about fashion its still a start 😀 its about the places i visit and the ones i like. I got curious by the fashion pictures on your blog. But there was something that bothered me and I had to mention it to you. I understand the fashion fads in India are reproductions of European and American trends and I seldom find fashion thats truly original and of what I would call personal or contemporary. Anyway, there were some pictures you took that were different. It was the ‘working class in fashion week’ 2013. These pictures were distant, people were distant. Very different from the other pictures that shows the ‘model’. Also its unclear if you ask the permission of the people photographed. I really wouldn’t bother to write as there are several opinions and people on the web but as you live in Delhi, and work as a photographer, its close to the bone. In this case, the observer (i.e. camera) seem to convey the difference of class in the observed by giving them different levels of dignity. Do you do it for the irony? I think you’d mailed me as well and I replied to you there. HI Manou, please continue to feature frequently India’s fashion style. I often visit your blog. I hope to visit India soon. More success. Coleen from the Philippines. do you know somebody able to do that work for us? for example, take pict on BANJARHAT market of bags to begin…. 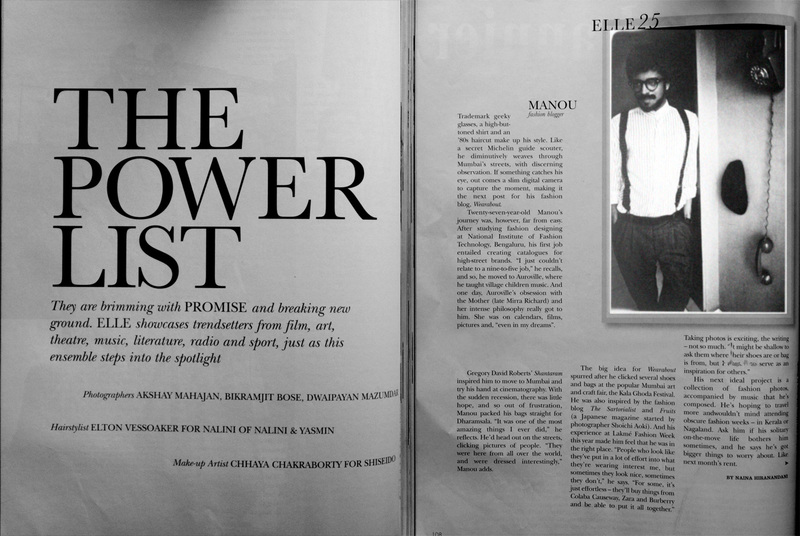 Hi Manou, stumbled into your blog and was pleasantly surprised to see so much of my hometown Shillong here. The photographs seem to come alive and it made me miss home a lot. Thank you. Hey Manou, love your blog. The pics are so candid and fresh. My friends and I are planning to travel to the North East, it’s going to be a combination of exploring the places as well as experiencing the fashion there. Any tips on which all cities to explore and where are the best flea markets and fashion bloggers we can meet up with? Hey Sanjana. Sorry about the late reply. I can only suggest the places I’ve been to. For thrift shopping: bara bazaar/police bazaar in Shillong, Wednesday market(near supermarket), the big market in town near the railway line(forgot the name) in Dimapur. I m in great comfusion. Whether to do fd from nift or engeenering frm nit? I m from a middle class family. And i have heard that the personal xpenses other than fee is much more. Kindly suggest a solution and also career oppurtunities after nift. Hey Manaswini. I am not sure if I understand ‘personal expenses’ correctly. During your FD course you would need to spend money on basic stuff like fabrics, threads, and different kind of tools that are required for garment construction/pattern making. Similarly you would be required to spend on tools for other subjects. But they are minor expenses really and will depend on you and how you want to execute your ideas and how much you want to spend on what you think is important. In general, your personal expenses greatly reduce after the 1st year — once you have ‘settled in’. After graduation, you could find work as a designer(clothes/textile/graphics), fashion stylist, fashion writer, pattern maker, fashion consultant, photographer, trend forecaster, etc. It depends on where your interest lies and what you are good at(which you will figure out during your course) as the work can be diverse within the fashion industry. A very neat and crisp blog. I would like to personally congratulate you as your blog wearabout has been selected by our panelist as one of the Top 100 Indian Fashion Blogs on the web.